Created a web app that utilizes Google Maps API along with Places and Geolocation. This app will detect where you are based off of your IP, or allow you to enter an address. 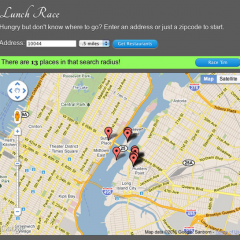 Then will return up to 20 results of food locations. Once locations have been found, you are given a chance to race them to see where you should have lunch, breakfast, dinner, whenever! Even created a mobile version to give it more of a Mobile App feel.